1. Preheat the oven to 170°C, gas mark 3. Butter a 225g non-stick loaf tin (about 12 x 20cm) or a 20cm-diameter round cake tin and line with greaseproof paper. 2. Place the Lurpak, sugar and lemon zest in a large bowl and whisk until fluffy. Still beating, add one egg at a time, waiting until each is fully incorporated before adding the next. Add the lemon juice, then the flour, salt and baking powder. 3 Spoon the mixture into your prepared tin and bake for about an hour or until golden and springy. If the cake is browning too quickly, loosely cover the top with foil but remember to remove it shortly before the end of cooking. Test the cake by inserting a skewer into the centre. If it comes out clean, the cake is cooked. 4. Sit the cake tin on a wire rack and leave for 15 minutes. 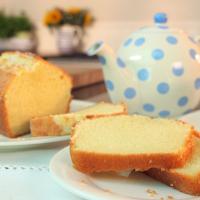 Then remove the cake from the tin and sprinkle generously with caster sugar. Leave to cool. Madeira cake tastes best if not eaten on the day of cooking, so when cold, tightly wrap in foil and leave for a day or two. It also freezes well. This recipe was first published in Tue Sep 30 14:48:45 BST 2014.